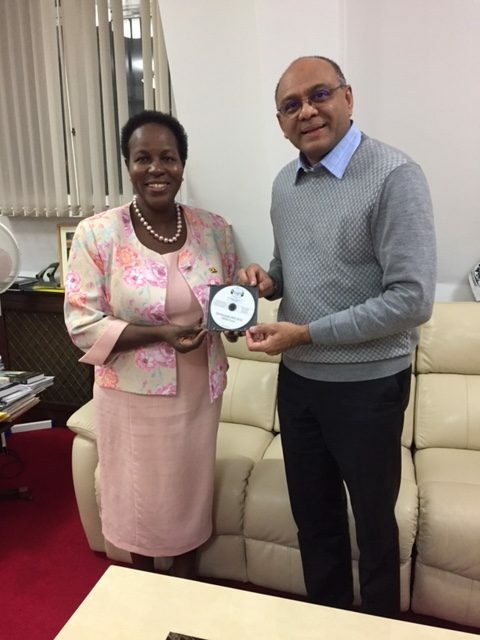 Mayoor Patel of OKAS Fund meets Ugandan High Commissioner to UK – Old Kampala Alumni Scholarship Fund. On 25th November 2016, Mayoor Patel BCAo, a founding trustee of OKAS Fund, was invited by , the Ugandan High Commissioner to the United Kingdom for a private audience. Mayoor took the opportunity to present to HE Kikafunda OKAS Fund’s seminal project of providing textbooks to his alma mater, the Old Kampala Senior Secondary School. HE Kikafunda was deeply impressed, saying that education was also one of her passions. She was even more pleased when she learnt that OKAS Fund was planning to purchase all books in Uganda to support the local economy. HE Kikafunda praised OKAS Fund’s ethos of empowering the beneficiaries of today to give back to the needy tomorrow. She went on to say that the culture of giving needed to be developed more vigorously and lauded OKAS Fund’s efforts to this end. She was so enthused with the project that she wondered if similar projects could be rolled out to other schools in Uganda. At the end of the audience, Mayoor presented HE Kikafunda with a CD capturing OKAS Fund’s projects. She concluded by saying, “You made my day. I will do all I can to support your work." Congratulations on starting such a worthwhile project on giving back to the school we all went to.